One of the beautiful things about Google+ is that it allows you multiple touch points, like Gmail and Google Contacts to develop a customer relationship management (CRM) experience. This can be a great marketing strategy. This is really the center of the entire Google+ CRM experience. As you edit your Google+ profile you can choose how you want the information on your profile to appear to people who circle you — which includes what will appear in Google Contacts for those people. If you set this to Public, everyone who circles you will see the information you make public. If you set it so only certain circles can see it, only those in your circles will see it in their Google Contacts. On the About page of each profile you visit, if that individual is already in your contacts, you can see what you have on that individual in your contacts. If there are notes attached, you’ll see them here. You can stay up to date in each customer relationship by developing a simple habit: going to the profile’s About page and looking at the Google Contacts information farther down the page. As you e-mail and interact with people in Gmail, they’re added to your Google Contacts automatically whenever you send them e-mail. Every time you receive an e-mail from someone who has associated an e-mail address with his or her Google+ account, you’ll see that Google+ account appear to the right of the message. Then you can circle the person or click the name to view the Google+ profile. This gives you additional opportunities to categorize those you communicate with for future reference, as well as learn more about them as you interact with them. If, say, Joanne’s e-mail address isn’t associated with a Google+ profile, you can still add her e-mail address to a circle. If she ever adds the address to her Google+ profile, the address you circled becomes a real Google+ profile automatically. In the meantime, you can still share messages from Google+ with her through the e-mail address you circled. 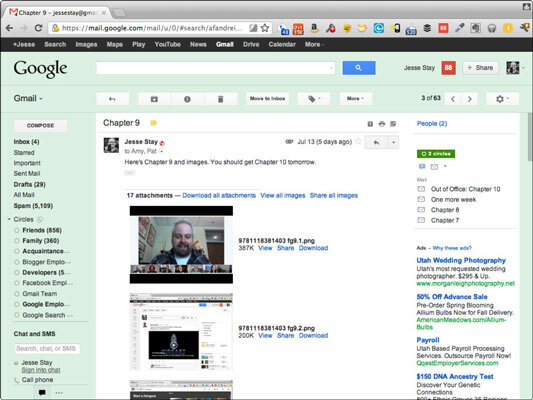 The Google+ record in the right column of Gmail will also show you her latest posts on Google+. If you select the Show Details link below her name and info, you can see all recent conversations you’ve had with her on Gmail itself. Each record, if available, shows the Google+ profile picture and any additional data made available. Google+ notifications work seamlessly with Gmail. 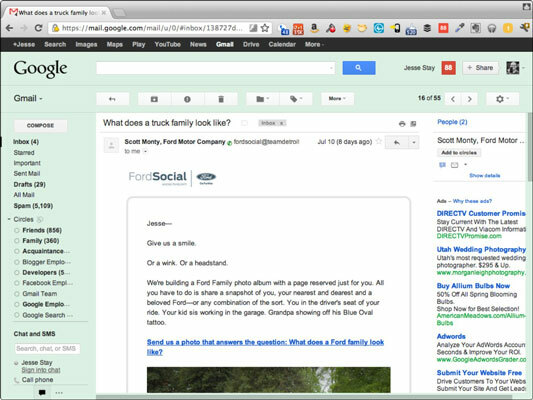 You can respond, +1, and share all from within Gmail. Posts update in real time, showing new comments right inside Gmail. If people are not added to your contacts automatically when you send them e-mail, be sure to select When I Send a Message to a New Person, Add Them to Other Contacts So That I Can Auto-Complete to Them Next Time under your Gmail settings on the main General tab (toward the bottom of the page). Opting to receive your notifications as e-mail gives you a searchable database of all your conversations in the future. If you want to know what conversations you’ve had with an individual, just search for his or her name. Gmail also shows you other threads and conversations you’ve had with this person if you click Show Details in the little Google+ box in the upper-right column of Gmail. 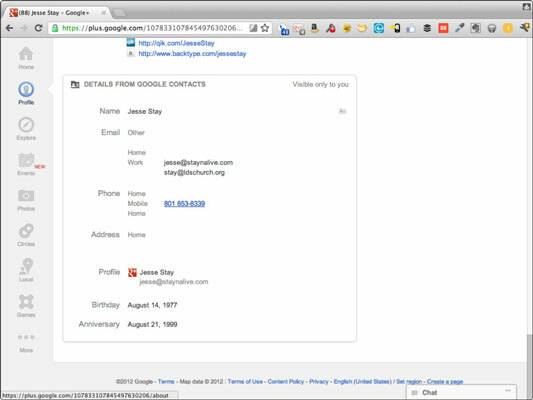 Besides the Google+ profile, Google Contacts serves as a place to store all your relationships. With each Google contact you can leave notes, adding information as you get it. This data also shows up on the individual’s Google+ profile if you’ve associated the two. 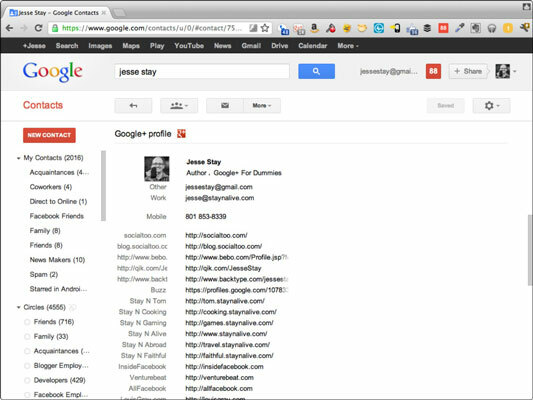 Inside Google Contacts, you’ll also see associated Google+ profile for the listed individuals. These profiles can provide additional information, such as where they work or where they’ve previously worked, intros they’ve provided about themselves, and other places they’ve lived. As you have similar names but different contact info, and you begin to discover that they’re the same name, you can merge those Google contacts into one contact for one individual. This combines even more information and puts all that data alongside the person’s Google profile. Now, everywhere you see that individual’s Google profile on the web, you can click it and have access to a plethora of information about the individual, as well as to any notes you’ve taken about that relationship. 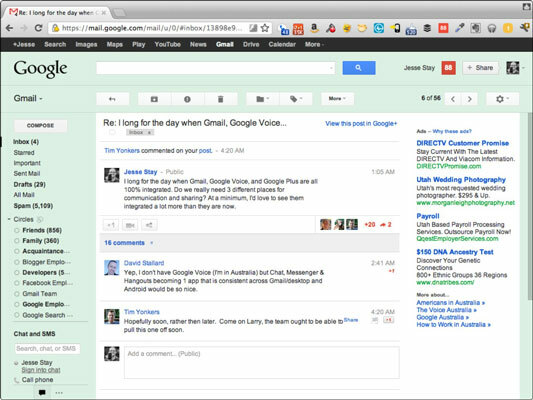 Go back to Gmail and you can also see all your conversations with the individual.